Come to the market with an open bag and open mind. A farmers market is an excellent place to shake up your usual routine of what you buy at the grocery store. You are at the mercy of Mother Nature and the farmer at a farmers market. This is not a bad thing; to be honest, I find it exhilarating. You can discover new vegetables and fruits, grains and dairy products. Challenge yourself to buy something completely unfamiliar and cook with it! The best news is that farmers LOVE to talk to you about their harvest. Ask them questions such as “What is this? How does this grow? How do you cook this? What is the best way to eat this?” They will give you loads of tips and inspire you to try something new and tasty. Another key component when you go to a farmer’s market is to bring your own reusable bags. When it comes to the summertime and it is berry season, it is also smart to bring your own containers because berries are so fragile. You want to make sure that they don’t get mushy by the time you get home. Do you want to have your own little herb bed or vegetable patch at home? Many of the farmers at the farmers market sell their seedlings (which are seeds that have already sprouted to plants such as herbs or veggies) and are ready to be plopped into some fresh soil at home (whether in a container or into the ground). This is a culinary treat for the most novice of home gardeners and cooks, but extremely rewarding and delicious. When you buy produce that has been freshly harvested, as opposed to produce on your grocery shelves, you are getting more nutrients. The bonus of shopping at farmers market is more nutritious produce! Don’t be scared of the dirt that you may see on some of your produce. This is a good sign that the farmer just dug it up and brought it to the market! Just remember to give your produce a good scrub or soak when you are ready to eat it. Be flexible. Don’t go to the market with a set plan in mind of what you want to buy or make. Instead, let what’s in season and what is available and what deliciously jumps out at you dictate what is on your menu. This is a liberating shopping experience, so let go of the “grocery list” and have fun! If you can’t make it to the market or the produce you want to buy is not in season, a wonderful option is Cookin’ Greens farm fresh, flash frozen veggies. They are a nutritious and convenient option to have stocked up in your freezer, when you want to make a quick and healthy meal. 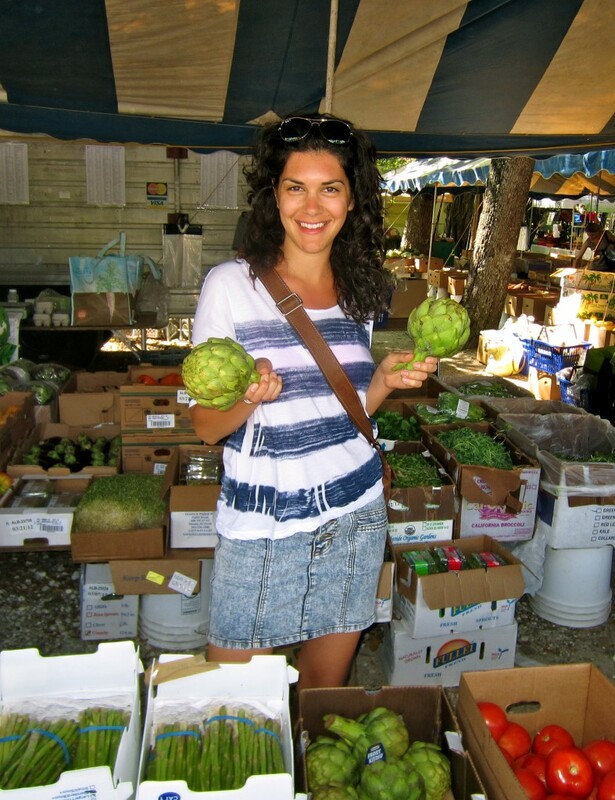 My name is Jaime Slavin and I am thrilled to be part of the Cookin’ Greens community. I am a passionate Nutritionist/Registered Dietitian with my Masters of Public Health, specializing in Community Nutrition. I love being part of the food and nutrition world, as it is such an exciting and dynamic field of work to be in. Whether I am writing articles, meeting with clients or doing workshops, I enjoy being able to teach people how to enhance their health and wellbeing. Cookin’ Greens is an excellent example of how eating healthy, wholesome and fresh foods doesn’t have to be complicated. It can be as simple and quick as having fresh flash frozen farm produce conveniently in your freezer. Being part of a community that supports these healthy options is essential in sharing information that is beneficial to your overall health choices.